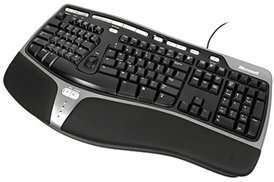 What is a Computer Ergonomic Keyboard and How does it work? A computer ergonomic keyboard is a computer keyboard that is designed to provide minimal muscle strain and diminish possible health problems. The keyboard reduces health risks, such as Carpal Tunnel Syndrome and also increases the speed of typing. The layout of an ergonomic keyboard differs in quite a number of ways compared to a normal keyboard. This generally takes some time to get used to. The keyboard above is an ergonomic keyboard that I own and would recommend. That took me quite a bit of time to get used to, however now I can type much faster than before and with little to no hand strain. The ergonomic keyboard is designed to allow your hands to rest without having to be on an angle. As you can see in the image above, there is a palm rest for your hands. Also the keyboard seems to be split into two parts. This allows your hands to remain straight, rather than having to bend inwards like they have to to do for a normal keyboard. The space-bar is generally bigger than what you would find on a normal keyboard. This allows for fast typing, since both hands can easily reach the space-bar. 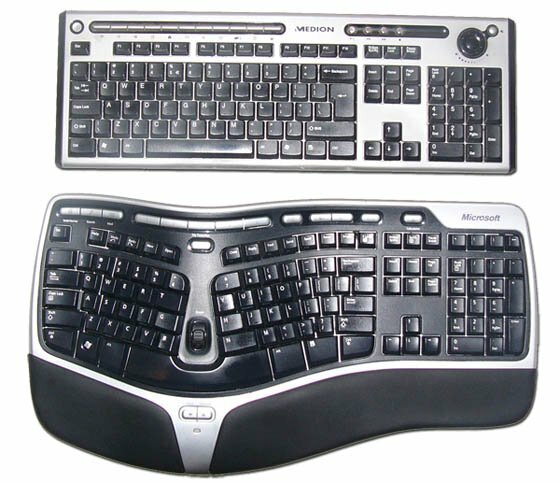 The image below shows you a normal keyboard, compared to an ergonomic keyboard. As you can see the ergomic keyboard is much bigger, as well as slightly slanted. The middle of the keyboard tends to rise up a little bit above the rest of the keyboard. Well so far this article has shown you all the positives of the ergonomic keyboard. So why doesn’t everyone own one? Well there are a couple of negatives. The first one is the cost! Generally speaking the ergonomic keyboard costs more than a typical keyboard. However, I personally believe the costs is well worth the upgrade. The other disadvantages are quite minimilistic in my mind, but these are that the keyboard takes more room than a normal keyboard (which is true) and that it will force your mouse to further away from the keyboard. Sure it does those things, but in my mind that isn’t that big a negative. So I hope that you have learnt a little bit about the computer ergonomic keyboard. If you are someone that uses the computer a lot, and don’t move around too much, then the Ergonomic Keyboard is just right for you. If you are developing hand strains from typing or feel that you would like to increase your typing speed, then buying a computer ergonomic keyboard is a great way to start fixing the problem. So far I’ve had two of the ergonomic keyboards they just didn’t hold up. Wow, I love the ergonomic keyboard, its an excellent choice of computer keyboards!